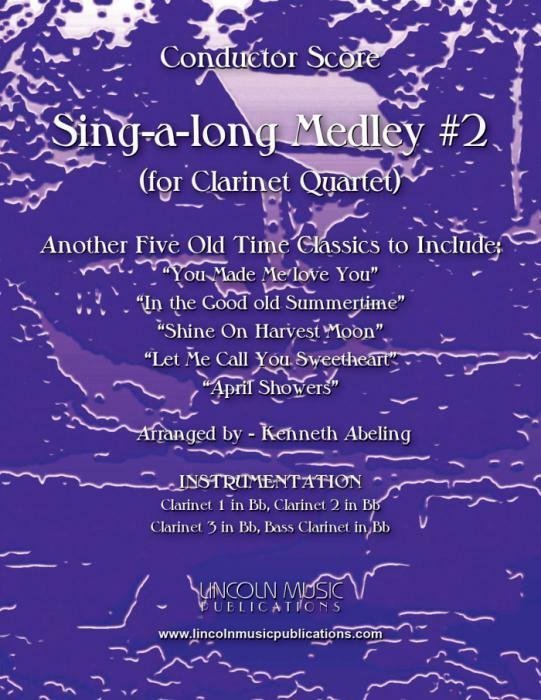 “Sing-along Medley #2”, arranged here for Clarinet Quartet is the second collection five “Tin Pan Alley” era songs arranged by Kenneth Abeling to include: “You Made Me love You” - “In the Good Old Summertime” - "Shine on Harvest Moon" - "Let Me Call You Sweetheart" & “April Showers". This piece is of intermediate to advanced intermediate level difficulty and is perfect for performances for elderly audiences, as a music history-teaching tool for younger audiences as well as other nostalgic performance applications. Playing Time 4:40 without repeats & 7:40 with repeats.